The First Battle of the Marne was a battle in the First World War. It was fought between the German Empire on one side, and the French and British on the other. The battle ended with a tactical retreat of the German army. It was one of the first signs that the Schlieffen Plan did not work. The battle cost the lives of over one million French and British soldiers. It also cost the lives of over 750,000 soldiers on the German side. The battle was fought from 5 - 12 September 1914. The battle marked the end of the German advance into France. It marked the beginning of trench warfare that World War I became famous for. The Schlieffen Plan called for an attack through Belgium. The Germans were to avoid the main French fortifications, on the German frontier. They invaded Belgium on August 3rd 1914. The Germans pushed through the Belgium army with little difficulty. After destroying the main fortifications in Liege and Namur, the German First Army and Second Army under the command of Alexander von Kluck and Karl von Bülow, moved toward Paris. At the Battle of Mons the British Expeditionary Force (BEF) halted the German forces temporarily. They inflicted heavy casualties on the Germans. But the French army and the BEF finally retreated towards the River Marne where they waited for the Germans. 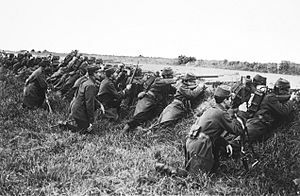 With no real opposition the Germans moved as quickly as possible and prepared to face the French and British at the Marne River. This was first major battle of what would become the Western Front. The Germans moved to within 30 miles (48 km) of Paris. The French government fled the capital for the safety of Bordeaux. The Germans were so close that they could fire their massive railway guns (massive cannons mounted on railroad cars) right into Paris. During the battle there was not any way to move French troops fast enough to the front. But there was a solution. General Gallieni called for every taxi and driver to report for duty. Paris had about 10,000 taxis but because of the war only had about 7,000 drivers. Gallieni's plan was to move the troops by taxi, which at the time was a very new invention. The taxis moved through the night and day to carry soldiers. The drivers received 0.20 francs (₣) per kilometer. But by September 8, the taxis had only brought about 5,000 soldier from Paris. In a battle with over a million men, 5,000 could not make a great difference. Also, most of the soldiers that came by taxi were held in reserve. The German Second Army led by Bülow decided to move south to destroy the French Fifth Army. General Von Kluck did not know about this so he continued to move up and engage the French. With this movement a large gap was created between the two German armies. The British and French counterattacked into the gap and by September 10 the Germans retreated. Paris was saved. The Germans retreated forty miles from the Marne. Since their plan had failed they did not know what to do. They had not been trained in trench warfare but their only recourse was to dig in and wait for the allies. Eventually the trenches they dug reached 300 miles in length. First Battle of the Marne Facts for Kids. Kiddle Encyclopedia.